A potential good investment for your sports cards is to have them graded. But if you are new to card grading, it can be a bit overwhelming. Grading companies began their services in the 1990’s. A lot of different grading companies have come and gone, but three are still around today that are considered the most reputable: Beckett Grading Services (BGS), Professional Sports Authenticator (PSA), and Sportscard Guarantee (SGC). PSA is located in California, BGS in Texas, and SGC in Florida. So in order for you to have your cards graded, you have to mail them to one of the companies for review. WE CANNOT GRADE CARDS ON-SITE IN OUR STORE. We do however submit orders for customers on a monthly basis to both Beckett & PSA. 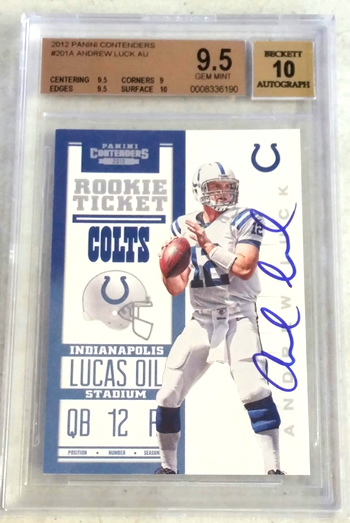 For more information on that please check out the Beckett or PSA page. How do the companies grade the cards? Cards are graded on four categories: Centering, Edges, Corners, and Surface. Each category is graded on a 1 - 10 point scale. Then an overall card grade is determined by taking the average of the four category grades. What cards should I grade? The answer to this question can vary for a lot of people. Some people like to have their personal collection cards graded so they are protected and match the rest of their collection. But if you are looking to add value to your cards, usually you want to stick to a few types of cards: Vintage cards (pre-1970’s) of the star players, and rookie cards of key players. There are a lot of other cards that by getting graded could potentially increase its value. So it’s best to do your research on what you have before submitting your cards for grading. For more information, please check out this article from Cardboard Connection.